Wow my back is seriously achy now. And so are my shoulders. Probably because I've spent the better part of the past 6 hours or so hunched over my laptop editing photos. And after all that time (dinner included), I'm still only halfway through! O_O BUT, I'm happy with the stuff I've gone through so far. :D There are moments when I kinda wonder if well, I should be spending my time doing other more productive stuff like erm studying/reading up on the stuff I've been exposed to this week at my posting but then the more I think about it, the more I feel I should really treasure this relative freedom that I have now at the moment and do the things I enjoy doing while I still have the time and am not burdened by unhealthy amounts of stress that will be the likely case in a few months time. The truth is, these photos are way backdated. :P I'm not anywhere near Tokyo at the moment! I'm actually in Montreal now and will be here for the next 2 months or so for my elective. Many many Montreal photos/experiences coming up soon but before arriving in Montreal, my mum and I actually stopped over at two places; the first being Tokyo, for just over 24 hours (something to do with her getting a cheaper round the world flight ticket that way; beats me), after which, we visited my Uncle's family in Seattle. :) It's all on the way, really. 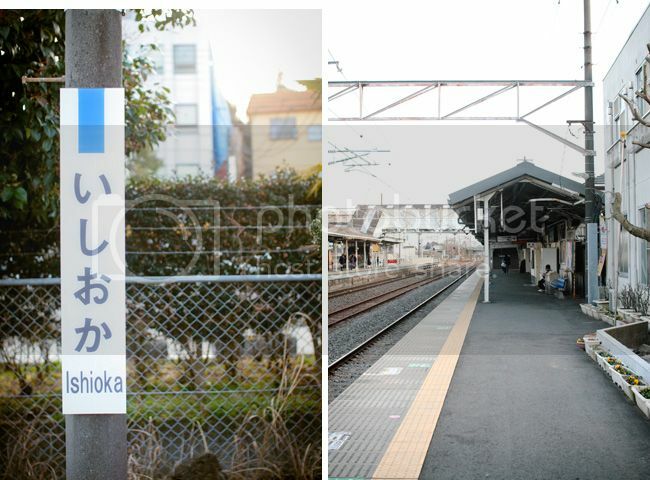 So when we were in Tokyo, we decided to visit my cousin who's actually teaching English in a more rural city called Namegata (in Ibaraki Prefecture)(it's such a small place hardly anyone's heard about it) that's about an hour and a half away from the Tokyo city center by an express train. A couple of things that really stick out in my memory of our time there include 1. BEING SUPER DUPER COLD. We were REALLY freezing our asses off! 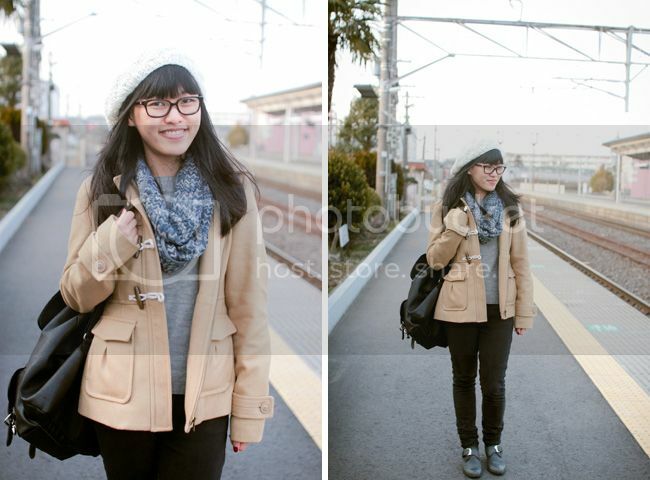 I guess we didn't expect winter in Tokyo to be so cold but when we were there, we encountered snow. ;p "Lucky" us, eh? 2. Being as always, impressed by the sights of rural Japan. Our train stopped at Ishioka (that's the bigger city next to Namegata) and while we were waiting for my cousin to pick us up, I couldn't help but fall in love again with Japan. I love the look of the train platforms, really. :) They bring to mind Japanese TV serials and anime (Slam Dunk FTW!). 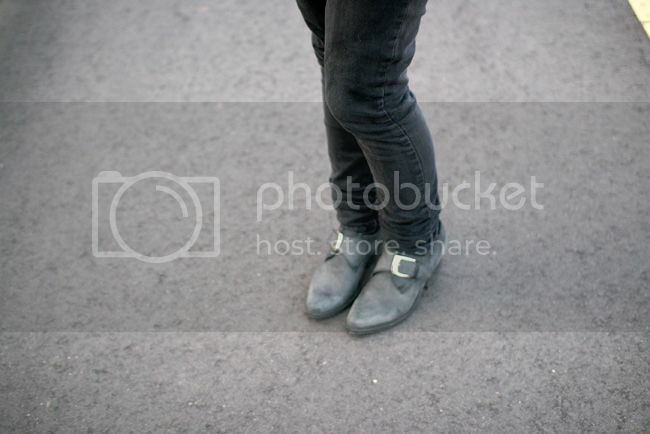 I'm really happy to have rediscovered these low ankle boots that I'd gotten ages ago from an online store. I never wore it that much back home because the first time I wore it I was silly enough to not wear socks and ended up with a bunch of blisters. But recently in the past month or so, I've started wearing it with jeans (and socks!) and it's been a real hardy pair of shoes. :) I guess it means it's always good to go back to your closet/shoe cupboard and see if there are things that need a bit more lovin'/a second lease of life. Isn't this awesome? My cousin's learning Japanese by himself at the moment and he's got all these post-its EVERYWHERE. 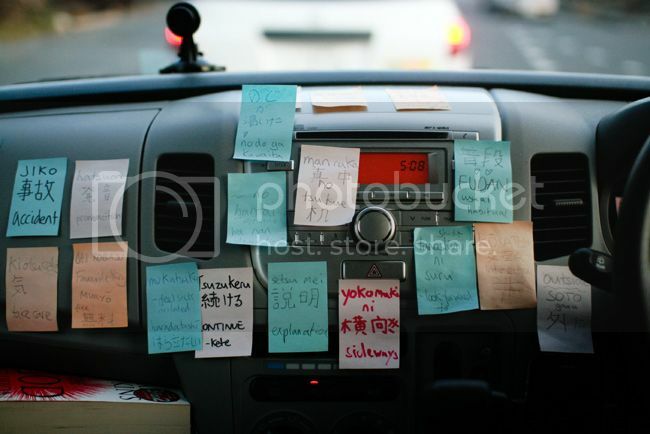 In the car, on the walls in his apartment... Makes me really miss learning Japanese. :(( It's just so difficult to keep up with a foreign language if you're not actively using it all the time. I know it's really possible (I have a friend who not only is as good as native speaker, but he also hangs out with a lot of Japanese friends, goes for Japanese karaoke sessions and takes the highest level of exams yearly. That's perseverance!) but I guess at the moment I'm focusing on other stuff... It's always been a dream of mine to take a year off to teach English in Japan though. Hopefully next time! My mum and my cousin in the HUGE supermarket near his place. It's ginormous and awesome but to put things into perspective, it's about the only fun thing to do there. There are no shopping malls. I can understand why he pops into that mega supermarket 2 - 3 times a day. ;p I would probably do the same. 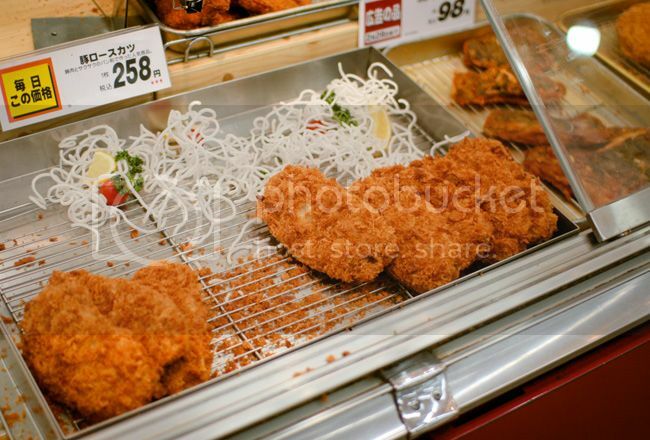 Besides, in Japanese supermarkets like these they have freshly cooked food like these incredibly yummy looking freshly fried potato croquette! And in the evening time before they close, all of the cooked food goes for like half price or something great like that, so all the house wives (and my cousin included) hustle for whatever's left. 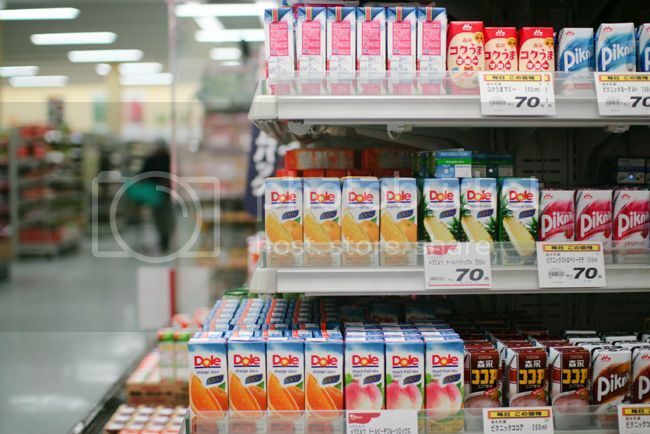 Left: All those cute Japanese munchies!! 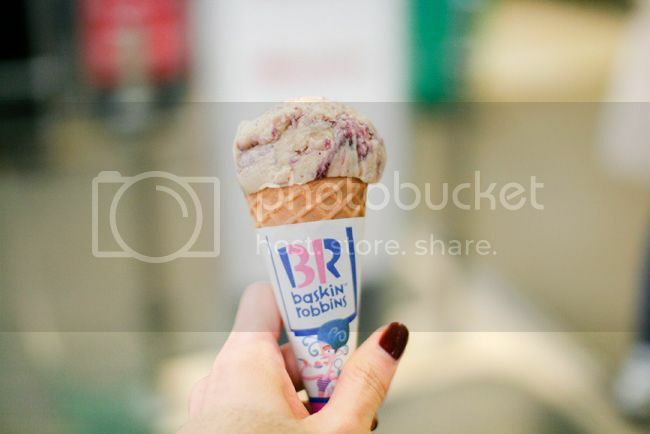 Right: Believe it or not, I'd never tried Baskin Robbins' ice cream prior to this trip. For some reason I just figured it could never be as good as Haagen Daz or like Ben and Jerry's. But NO, this was GOOD. 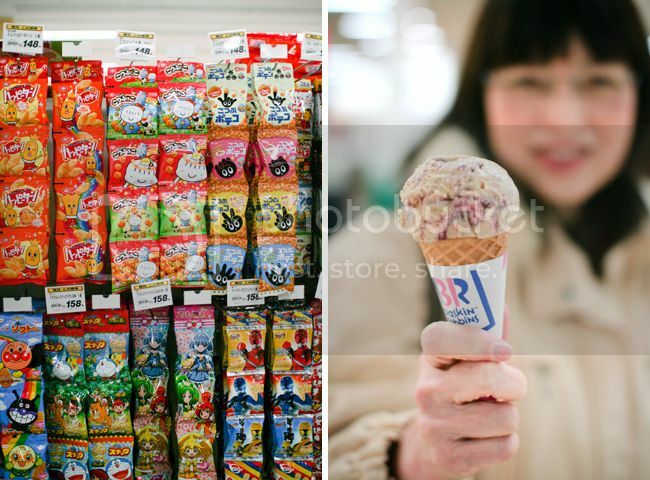 There were a total of 27 flavors available in the small Baskin Robbins' outlet in the supermarket! I ended up choosing some cool flavor like Tea and Scones which was so good! And the best part was that they had different sizes available so my mum and I got the Kids' size one to share. :p Perfect pre-dinner snackeroo! And for dinner that night, we met up with some of his fellow English-teacher friends and went for Yakiniku. It was INCREDIBLY good. All that tender meat (with lots and lots of layers of fat) that we walloped so quickly. I love the feeling of meat so tender it melts in your mouth but then after everything's over and done with, it's hard to not think about how it was only so soft and delicious because of the amount of fat in it. HMMMM. Oh but before I forget, the Yakiniku place was in another city (sounded like there really wasn't anything much in Namegata) that took about 1.5 hours to drive to. AND after that we traveled another 1.5 hour back to Tokyo. Too much traveling in one day. :( Ended up snoozing most of the time in the car. Something about heated cars in winter time that are perfect for sleeping in. Ever felt that way? 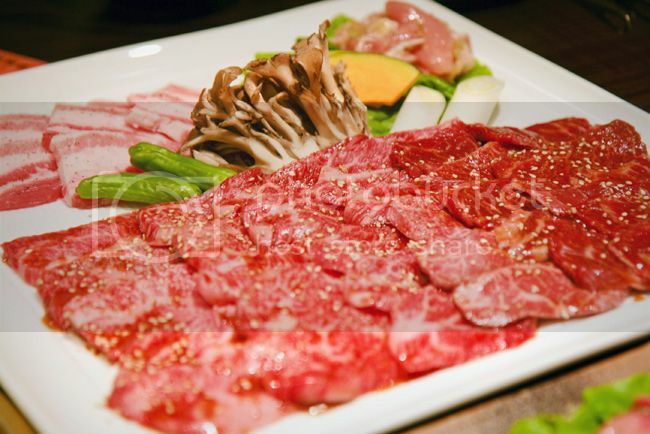 the yakiniku looks really good! haha and you are right about the fats there! HMMMMMMM. and btw i wish i have such supermarkets here - german supermarkets are cold and unfriendly.